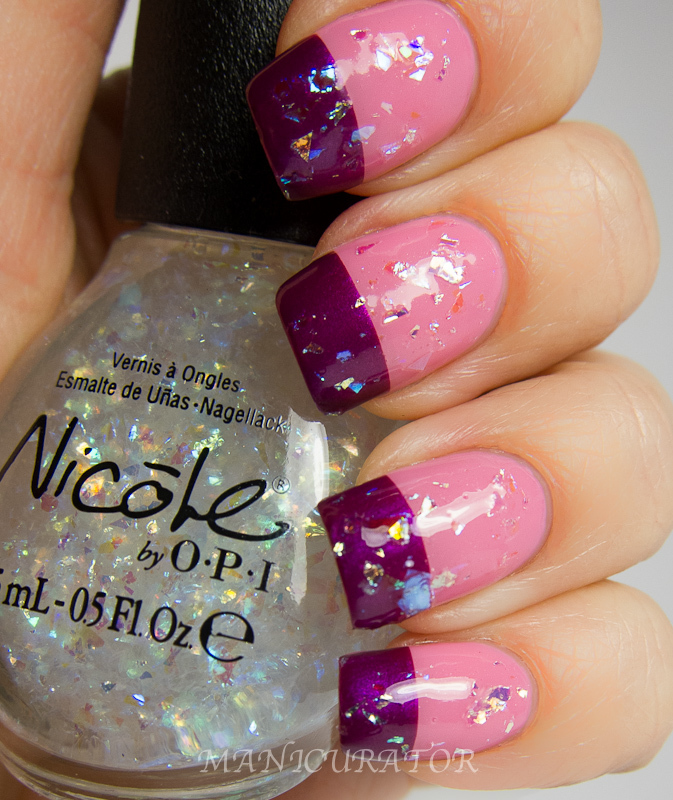 Another look using 3 of the Selena Gomez polishes from the upcoming Nicole by OPI collection. 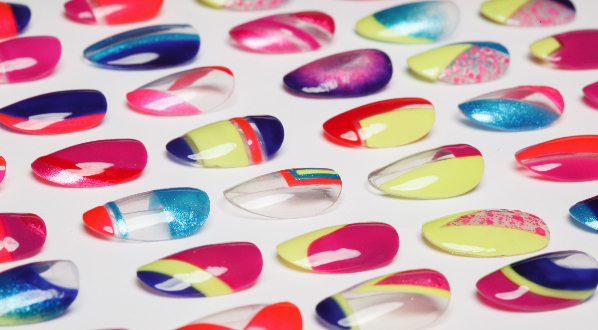 There are 14 in this set inspired by the actress and singer Selena Gomez. I'll be showing you the rest of these in separate posts. I posted a New Year's Eve look with a different 4 polishes from the collection. See it here. 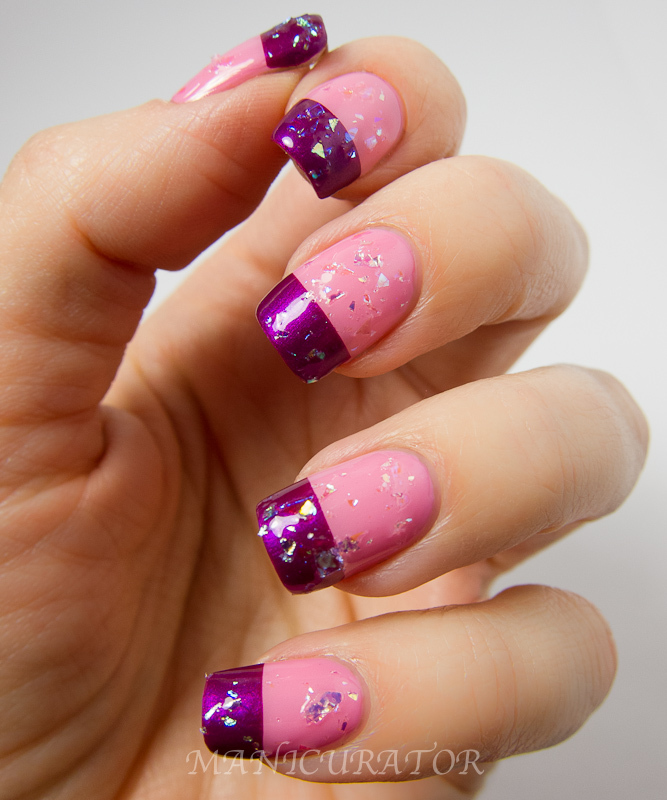 And a glitter color block, see it here. 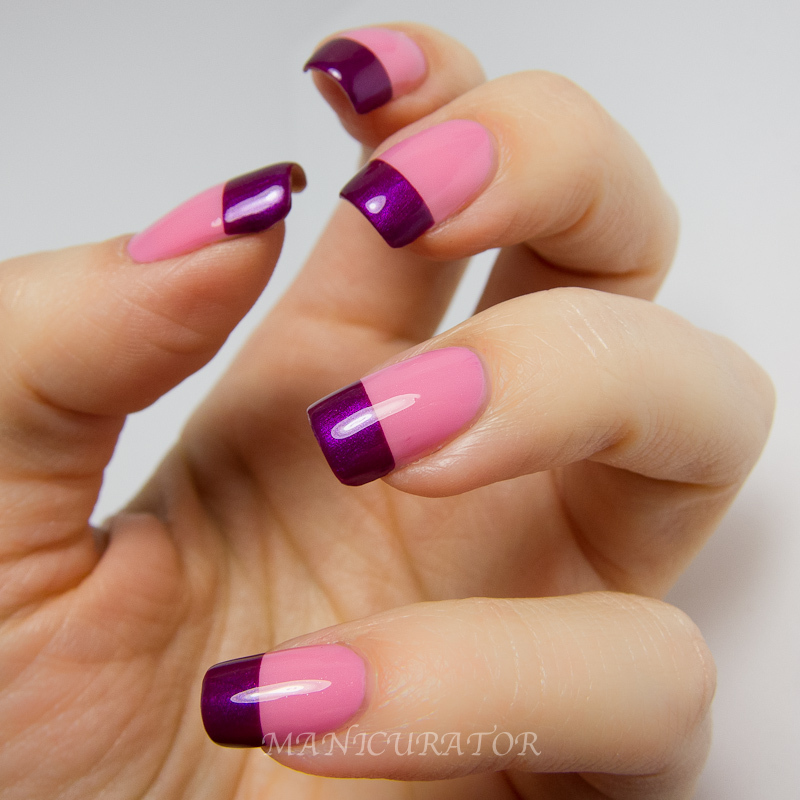 I definitely wanted to keep this one simple and fun, showing a classic french tip..but updated with color. I started with 2 coats of Nicole by OPI Naturally. It's a lovely medium carnation like pink, with a very slight shimmer. Excellent formula. When that was dry I taped off and added 2 coats Nicole by OPI Pretty in Plum to the tips. 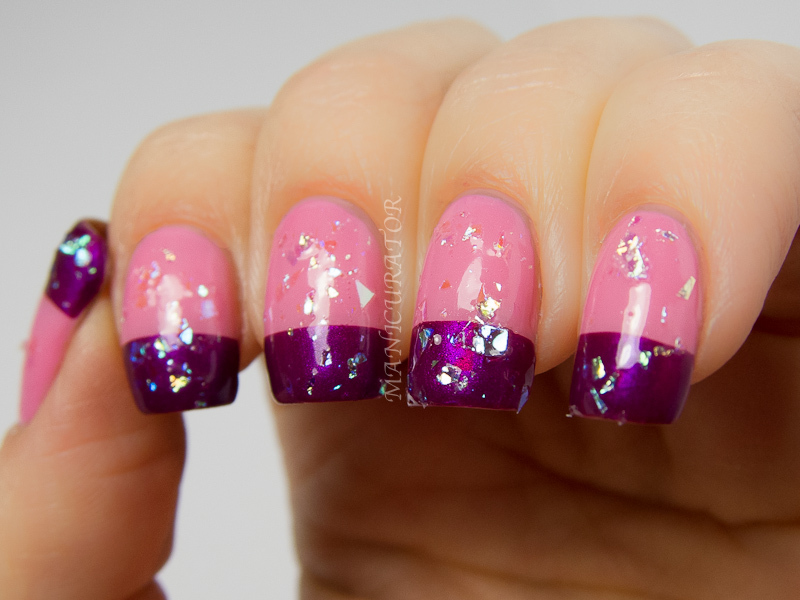 Another fabulous formula for this pinkish purple with a gorgeous shimmer. I love this combo. And finally I wanted to try out Nicole by OPI Heavenly Angel. It's an iridescent shredded top coat. This formula is a little bit thicker and in my opinion is harder to work with but not impossible. I have one coat on here. Pretty in Plum Selena Gomez lacquers will be available January 2013 for $7.99 each at retailers including select Target, Walmart, CVS, K-mart, Rite Aid, ULTA, Sears, Meijer, Fred Meyer, Kroger and H-E-B locations. In Canada, this line will be available for $10.99 each at Shoppers Drug Mart, Walmart Canada, Jean Coutu, Loblaw, and London Drug. Wow, this is a really gorgeous combo! Do you know how Heavenly Angel compares to CG Luxe and Lush? I love it, but I think without the glitter! 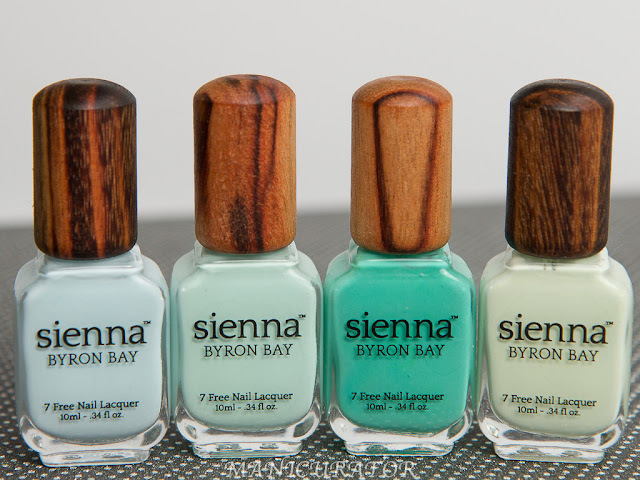 I really want some colors from this collection. lovely colour combination and so neat! i actually prefer it without the glitter! Wow! I love this combination of pink and purple! Looks awesome! Wonderful colors, looks almost juicy! Beautiful colors and job, Its pretty both ways,but ,my preference is w/o ! Awesome! But is better without the glitter IMO.